Research and development (R&D) is not a strong suit of Philippine companies. An international ranking of how much companies spend on R&D compiled by the Department of Science and Technology (DOST) showed that the Philippines placed 44th out of 138 countries. That’s way below other Southeast Asian countries such as Malaysia, Singapore and Indonesia. To be sure, there are exceptions, and one of these is a high-tech engineering company based in Davao City. RAD Green Solutions Corp. designs and builds specialized equipment to dispose of infectious medical wastes. Indeed, through constant experimentation and innovation, the company has developed a US-patented technology that can safely dispose infectious wastes at a fraction of the cost using imported equipment. Founded only seven years ago, RAD Green was started by Roderick Dayot, an engineer, and businessman Ivan Lim. Dayot finished his bachelor’s and master of science degrees at the University of Mindanao and his doctorate degree at the Mindanao State University (MSU). Lim graduated from a management course at De La Salle University and completed his Masters in Entrepreneurship degree at the Asian Institute of Management (AIM). The two worked together at the Dos Palmas Resort in Palawan, with Lim as the general manager and Dayot as the engineering manager. Together they were confronted with the problems of garbage disposal in a small island. “We were convinced that garbage should be reduced, treated and managed,” recalls Dayot. That eventually led the pair to develop a machine prototype to dispose of hazardous waste in 2010. The equipment that Dayot and Lim developed, which they would later call Pyroclave technology, is based on pyrolysis, or decomposing waste through exposure to very high temperatures. The technology is also non-burn, which means the waste is not directly incinerated but the combustion along the machine’s chamber lining effectively disinfects it. However, RAD Green’s technology is unique as it adopts “hydro-burning” or the use of water to increase the burning effect of fuel. Its hydro-burn ability falls within the Philippine Clean Air Act’s emission standards. Dayot and Lim entered their technology in the 2011 ON3 Pitching Competition organized by the Science and Technology Advisory Council (STAC) of Silicon Valley together with the DOST and Department of Trade and Industry (DTI) for technology-based startups. RAD Green won the Philippine leg of the competition, and went to Silicon Valley the following year to compete with other winners from other countries. Unfortunately, they came home empty-handed. “The US market was not a good fit for our prototype because they wanted much less contact between the operator and the medical waste. They wanted a fully automatic machine with a much larger capacity. We were not ready, but that really challenged us to become better,” shares Dayot. Their first prototype was called the Pyroclave Beetle that could process 40 kilograms of waste per hour. The duo took the comments to heart and improved their invention’s design and capacity. 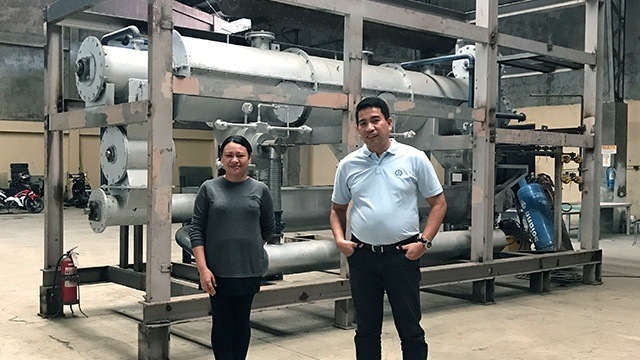 Eventually, they came up with improved models, two of which are the Pyroclave Mantis, which is priced at Php33 million and has a daily capacity of eight to 10 tons of waste, and a smaller model, the Pyroclave Optima Mantis, which clients can buy for Php14 million to process two to three tons of waste per day. Both come with a one-year warranty. The Pyroclave system works by feeding the waste into one side of the machine. It comes out the other end disinfected and reduced in volume. The original weight is cut down to as much as 80 percent. First, the waste enters an oxygen-free shredding chamber where the waste’s volume is reduced. Then it moves into a thermal chamber that houses the proprietary technology. The temperature of the combustion is set depending on the client’s requirements (either disinfection or carbonization). 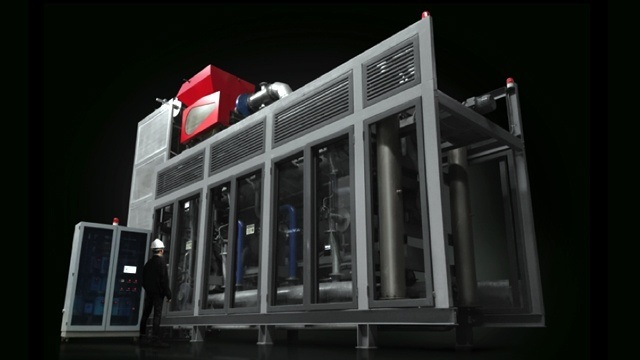 Lastly, the waste enters a cooling chamber and exits the machine as unrecognizable, dry and odor-free material. The Pyroclave machine is operated via a touch screen control system. “Our proprietary technology was designed to replace the autoclave system, which uses steam to disinfect medical tools and food. Autoclave is really not intended for disinfection [of biomedical waste], but health institutions have little or no alternative,” says Dayot. 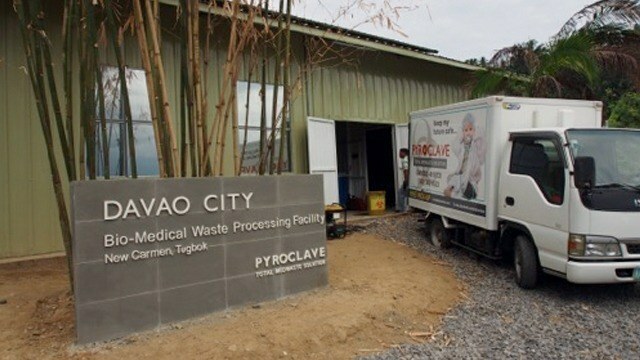 With a Php2 million loan, the pair built a Pyroclave Beetle, which they used in 2012 to serve hospitals and clinics in Davao City. In a year, they were able to earn enough money to pay off their loan. Their clientele today includes government agencies and private institutions that have the option to purchase one machine or outsource the management of hazardous waste to RAD Green. While clients can purchase a Pyroclave system, RAD Green personnel continue to operate the machine to ensure proper utilization of the technology. 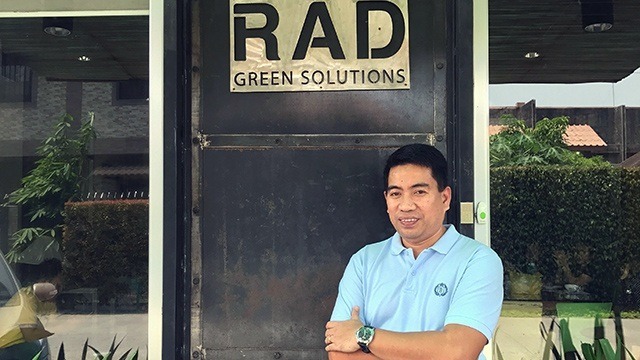 RAD Green’s first big client is one of the major hospitals in Davao City, San Pedro Hospital, which produces approximately 300 kilograms of biomedical waste per day. Now, they also cater to the Southern Philippines Medical Center (SPMC), which produces up to two tons of medical waste per day. RAD Green’s list of clients has grown from 12 in 2013, 52 in 2014, 75 in 2015, 116 in 2016 and 208 in 2017 and now includes non-healthcare companies such as Smart Communications, Nakayama Technology Corp., Mega Asia Bottling Corp., Mang Inasal, Tadeco, Franklin Baker, Marco Polo Hotel and University of Mindanao. They also have clients in Luzon, including the medical center in Antipolo City. With a growing client portfolio, RAD Green has expanded its facilities. Their Davao office started as a rented 550-square-meter space, which has now transformed into a 3,000-square-meter office and fabrication warehouse. They also rent a 1.5-hectare lot near the city landfills where they operate their machines. In 2016, operating facilities were also set up in Koronadal (with two Beetles and one Optima Mantis) and Valenzuela City in Metro Manila (with one Optima Mantis). With a growing market base, the company’s net income surged seven-fold from only Php1.7 million in 2013 to Php11.7 million in 2016. Dayot and Lim have big plans for their technology. This year, they are finalizing their ISO certification in preparation for their plans to go global. They also just recently received a certification from the Meteorology and Environment Protection Authority, a Saudi Arabian government agency that helps to regulate the foreign products entering their local market. The certification took two years to acquire but RAD Green got assistance from a Saudi Arabian partner company, KAWN Environmental Services. And it appears that for the founders of RAD Green Solutions, Saudi Arabia is just the start. If their technology works in one of the world’s most challenging physical environments in the Middle East, Europe itself could very well be the next market for the company’s Pyroclave technology. Amid the company’s proven success with its Pyroclave technology, research and development into new fields continues. Already it is preparing for prototyping a lighter rotary engine with fewer moving parts that will generate lesser friction than conventional piston engines. It is also researching the potential of algae as a source of biofuel, wastewater treatment, carbon sequestration, nutrients and medicines. Fueled by success, RAD Green Solutions is laying the ground for emergence of new groundbreaking technologies in the future.